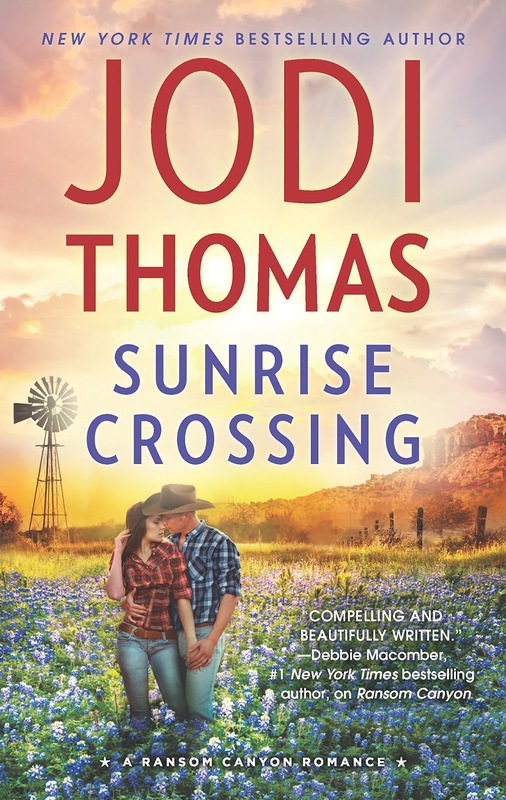 Jodi Thomas takes her readers back to Crossroads, a tiny town in West Texas, where three strangers, each with her/his own secrets, show up and change the lives of some of the town’s residents in surprising ways. Despite the success of her Dallas art gallery and the impressive trappings of the life she has created for herself, Parker Lacey is lonely and isolated, without family or close friends. The barriers surrounding her begin to erode when one of her artists asks for her help. Almost ten years earlier, Parker bought a farmhouse in Crossroads on a whim, with the idea of turning it into a personal retreat where she could relax and paint, but she has been too busy building her business to do more than give a passing thought to her purchase. When the young artist she befriends needs a sanctuary, Parker sends her to the farmhouse. Victoria “Tori” Vilanie is not just any young artist. Only twenty-four, she is a star in American art circles, an artist whose fame has been increasing since she first gained widespread attention at fifteen. Despite her fame and the fortune her paintings have earned, Tori is unhappy with her life. She may have reached adulthood chronologically, but her life is controlled by her mother and stepfather. She is desperate for a different life, and so she runs away. In Parker’s farmhouse, she finds the peace and the freedom she needs. She also finds a friend in Yancy Grey. An ex-con and former drifter, Yancy found a home in Crossroads. After seven years as handyman and gofer for a community of retired teachers, he has been accepted as belonging to Crossroads. With his connection to the Stanley family revealed and his position as heir to the “Gypsy house” established, his ties are even stronger. Yancy’s spare time is devoted to remodeling the hundred-year-old house, a task in which he takes great pride. His life is so much fuller than he ever dreamed it could be that he is scarcely aware of what’s missing until a shy beauty he calls “Rabbit” captures his heart and enlarges his dreams. Parker, who lost both her parents to cancer before their fortieth birthdays, believes that her own life will be short. When inexplicable leg and back pain plague her, she is convinced it is a symptom of the disease that killed her parents. Rather than waiting to die, she decides to live her remaining days. It is clear that Tori needs her in Crossroads, so Parker ignores her doctor and makes plans to ditch the agents who are tailing her in hopes that she will lead them to Tori. The problem is that she needs help, and she is so alone that she had no one whom she can ask for a favor. In desperation, she contacts Clint Montgomery, the man from whom she bought the farmhouse, who reluctantly agrees to help her. Clint is almost as isolated as Parker. Widowed shortly before he sold the farmhouse, he has immersed himself in grief and regret. Gruff and surly, he resists becoming involved with Parker. But his efforts are in vain. Parker makes him feel again. He can manage the reawakening of desire, but is he ready for the level of resurrection that accompanies her entrance into his life? Bounty Hunter Galen Stanley, alias Gabe Santorno, is one of the hired guns Tori’s stepfather has set on her trail. Gabe never expected to end up in Crossroads, a town he fled more than thirty years earlier. Even less did he expect to find that his past is not as dead as he had thought for three decades, a discovery that transforms him from hunter to protector. As the threads of these lives become entangled with one another and with the lives of other Crossroads residents, secrets are revealed, danger threatens, and cautious hearts question if the promises of love can be trusted. Jodi Thomas once again proves that misfits and loners are no less deserving of love than are more conventional heroes and heroines. Quirky Crossroads, Texas, is the setting for her Ransom Canyon tales, and it provides both comforting warmth and idiosyncratic distinctiveness. Readers who have read the earlier books will find this fourth novel in the series offers a mix of familiar characters and new ones. The lead characters are sympathetic and engaging, and the poignancy of their stories will wrench readers’ hearts. (I fell in love with all the major characters.) However, Thomas is a skilled storyteller who knows the value of mixing humor with darker elements. A secondary storyline involving Deputy Fifth Weathers and pilot Madison O’Grady adds delightful banter and appealing lightness to the main stories which blend suspense with romance. Thomas’s Harmony series is one of my favorites, and the Ransom Canyon books are earning a place on my keeper shelves as well. If you like characters who are memorable and unexpectedly atypical and a plot crafted by a gifted storyteller, I highly recommend Sunrise Crossing. Meanwhile, I’m cheering the news that there will be two more novels in this terrific series. Wild Horse Springs, scheduled for release in February 2017, will feature the Brigmans. And--hurray!--it sounds as if both Sheriff Dan and his daughter Lauren will find their HEAs. 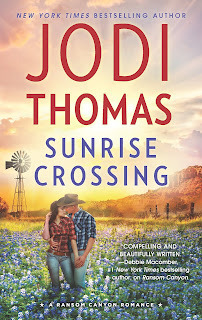 I will read anything Jodi Thomas writes - love her books! Same here, Mary. She's one of my favorites. I have read 2 of the Ransom Canyon books. Need to catch up. I have missed out on this series and need to find the back issues... *LOL* I loved Jodi Thomas' RWA classes she offered and I've loved her westerns from way back...so I know I'll enjoy these. Thanks, Janga! !